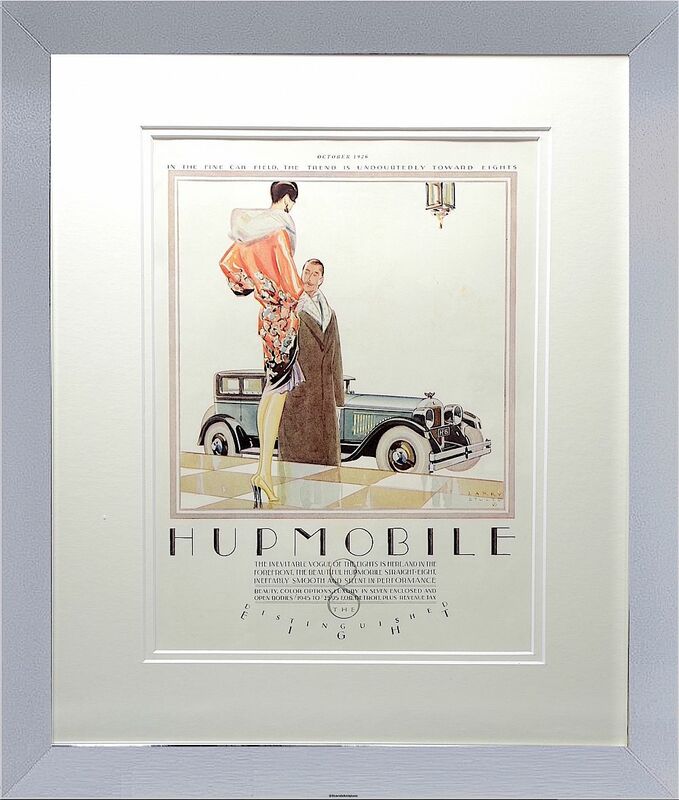 This is a wonderful 1926 original magazine advertisement by Larry Stults featuring the Hupmobile 8 motor vehicle. This one depicts a woman in a fur collared orange patterned flapper coat standing at the top of steps looking down on a man in a brown overcoat with a blue Hupmobile 8 in the background. We have had this framed with a double cream mount and a chrome frame. The Hupmobile was built from 1909-1940 by the Hupp Motor Company of Detroit. The Hupp Motor company was founded by brothers Robert & Louis Hupp in 1908. The first car (Model 20) was introduced to the public at the Detroit Auto Show in February 1909. The company initially produced 500 vehicles. Robert Hupp sold his shares in the company which continued to grow so that by 1928 sales reached over 65,000 units but began to decline by the beginning of the 1930s. Hupp could not produce its vehicles in sufficient quantity to keep manufacturing costs low and after a number of attempts to revive interest in their vehicles Hupmobile ceased production in 1939/40.